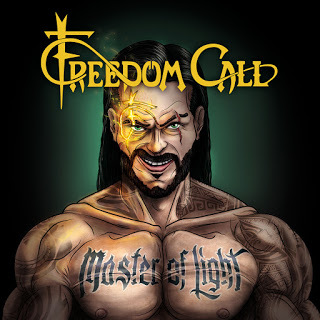 Freedom Call is a band from Germany that plays happy/power metal. Their last album was last year’s 666 Weeks Beyond Eternity which was a re-release of the album Eternity 2012. Now Master Of Light is the latest album, released on 11 November and 18 November (USA/Canada). Can they bring that smile back on your face with this album? The album starts off strong with the opening song Metal Is For Everyone. It’s a song that instantly let you smile. It also has some rhythmic parts which will make you sing a long and will let you head bang. Metal Is For Everyone is also a perfect quote, a good universal message. A World Beyond has an amazing chorus, with at the end a guitar solo and another catching chorus. The song Kings Rise And Fall starts off strong with fast paced riffs. Again, the catching chorus will make you easily sing along. After a slow song Cradle Of Angels they are blasting off again with Emerald Skies. Rock The Nation and High Up are instantly bringing a smile on your face. The vocals on this whole album are spot on. You keep smiling with the melodic riffs that keeps you singing and head banging. This is a perfect album, you just forget the rest and start smiling. If you like happy/power/melodic metal this is a band for you, go on and check them out!